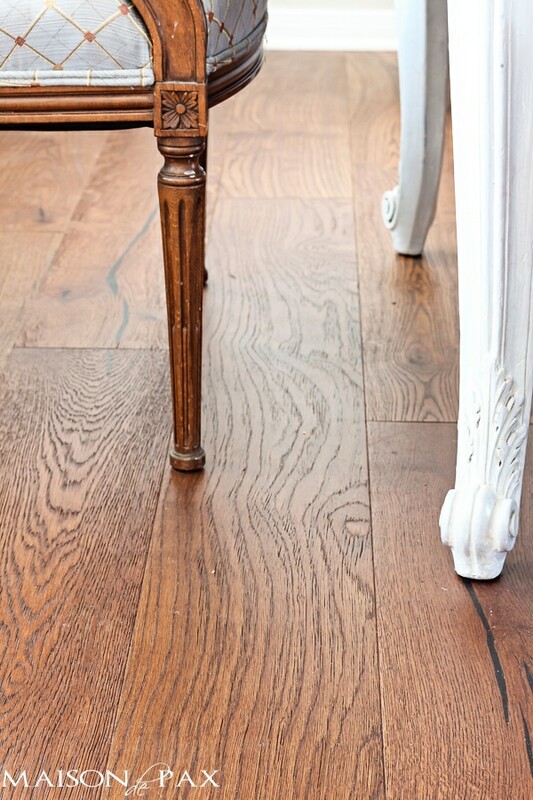 Looking for wide plank oak floors? 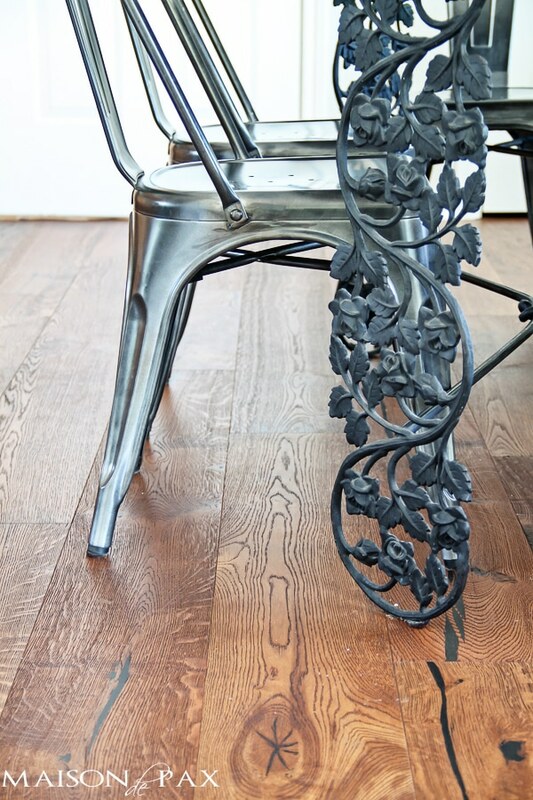 These gorgeous, rustic oak floors are a beautiful medium brown and wire brushed for a textured perfection. 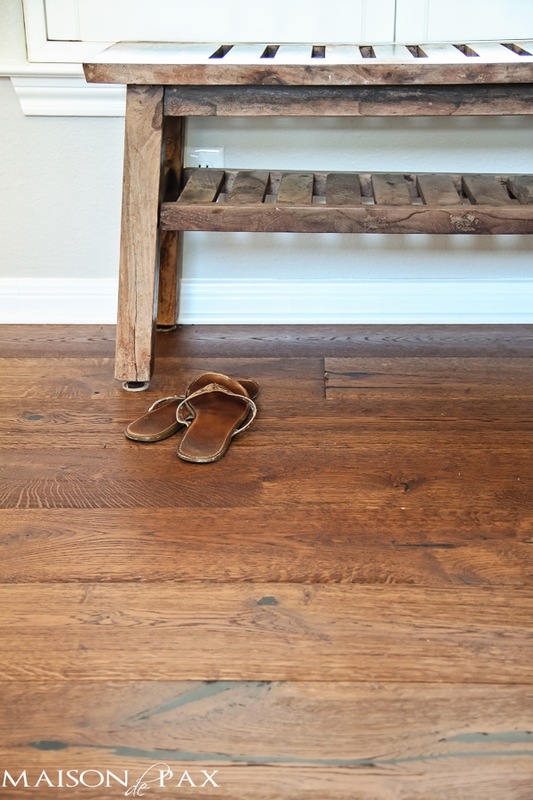 I shared a little sneak peek of our new wood floors last week and on Instagram and got so many questions… I thought you might like the full reveal. Do you remember what it was like before? Now there are engineered wood floors (which means a real wood layer over some plywood layers – like a veneer on furniture) by Green World Industries. 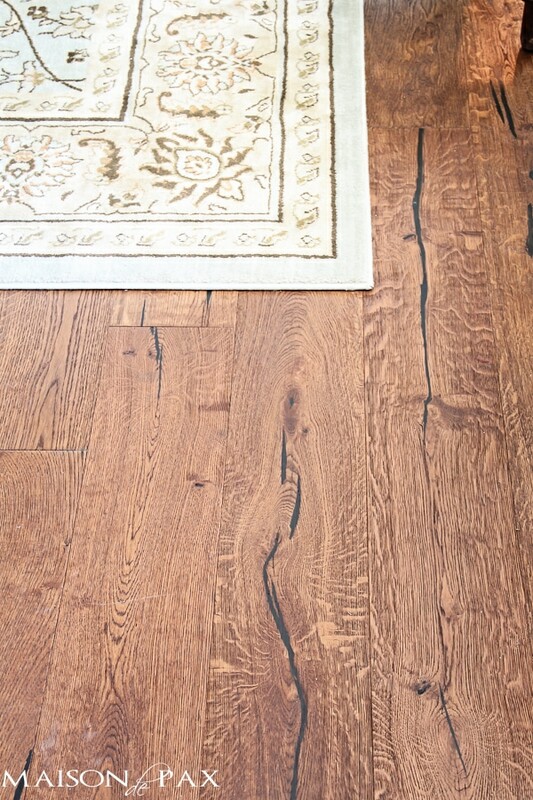 We chose a 7.5″ oak plank (the “Artisan Montmajour”) with a UV oil finish. We’ve only had them for a few months now, so I can’t speak to their longevity yet. For now, I just want to say how thoroughly pleased we are, especially with the new light gray walls. I think they are gorgeous, rich, and rustic, all at once. They pair well with our traditional rugs. And our more formal antiques. 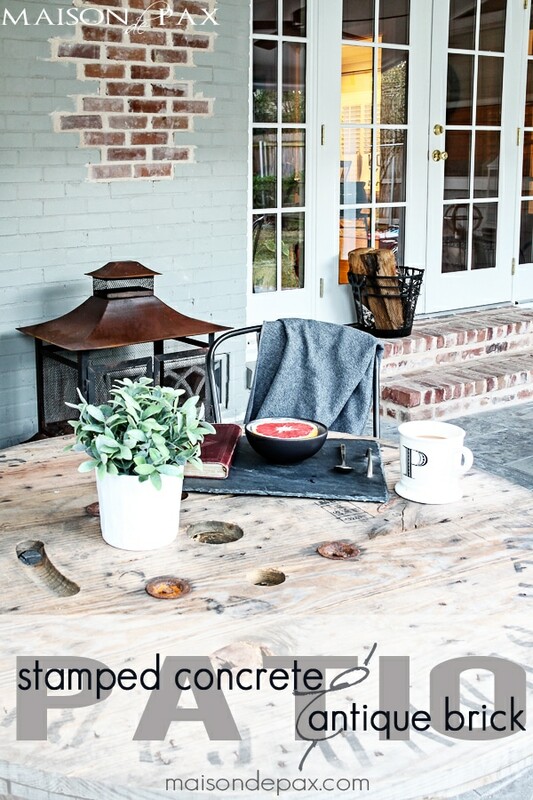 But I love how they complement our more rustic furniture, as well. And yes, the downstairs includes our kitchen and breakfast area. So far, we love them there, too. Because of time and money constraints, we opted to simply leave the staircase (which was formerly carpeted) and simply fill in the previously carpeted section with the wood planks to match the floor. The installers did a beautiful job, but now we can’t decide if we ought to paint some part of it white. It seems a lot of wood. You can’t quite tell from the pictures, but I need to paint the spindles a true white anyway (they are about 5 shades yellower than the rest of the trim)… so what do you think? 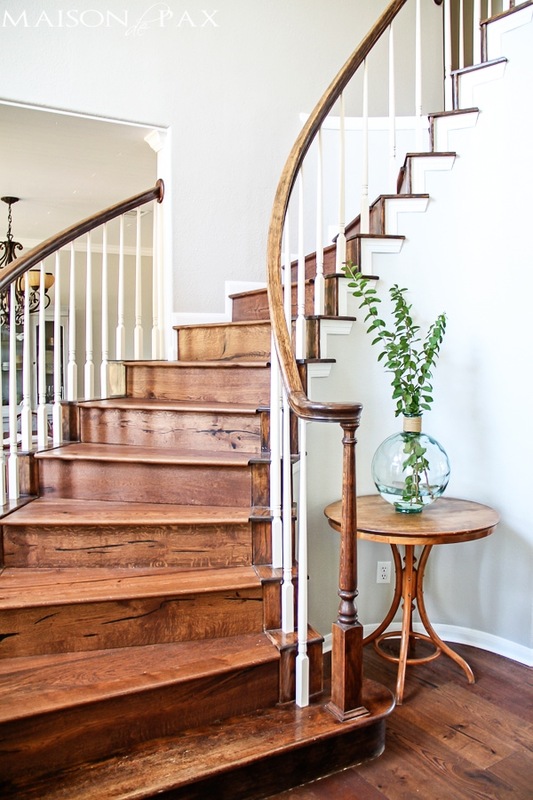 Would you paint any portion of the stairs white or leave them all wood? I am absolutely crazy about wide planked floors and these are no exception. I’ve never heard of engineered wood floors, but am fascinated now. I might have to do some research on whether this would be right for us. The risers on the stairs are a fabulous opportunity to do something stunning (or fun) at a later date. For now, I would paint them white. Later when you are itching for a project there are so many possibilities: a subtle stencil, graphics, flowers in your area, or even a story. In Florida there aren’t many stairs so I have never had the chance to do this fun project! Bonne chance! 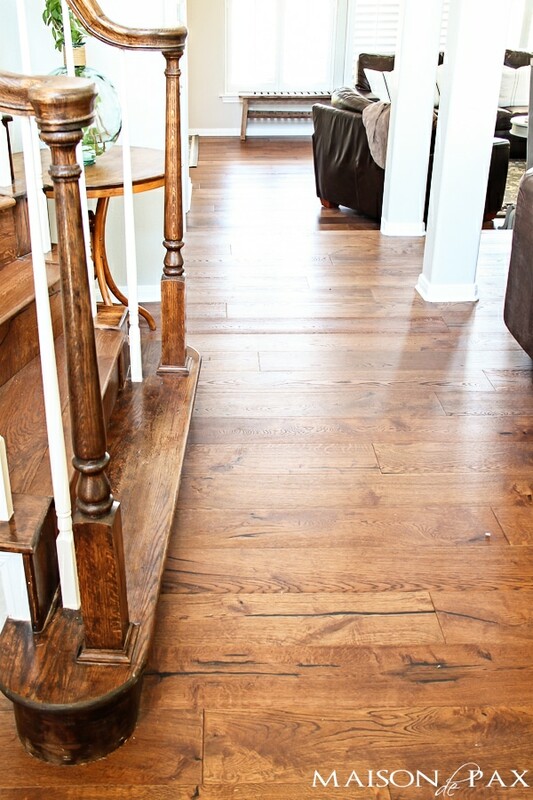 Just gorgeous Rachel….I so love wide planked floors…such a rustic elegance of a feel. Really love all of the wood! What BEAUTIFUL floors! Please do no paint any of them white. Rugs are great if you feel there is too much wood. I on the other hand think it is exquisite!! 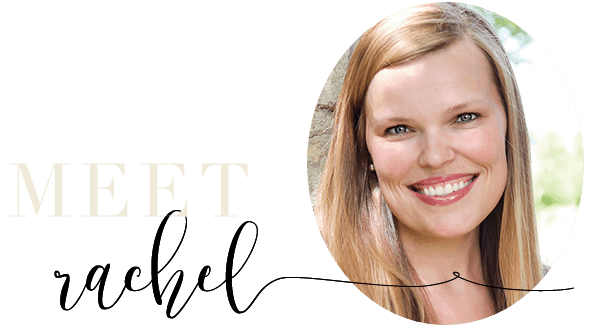 It looks beautiful, Rachel! 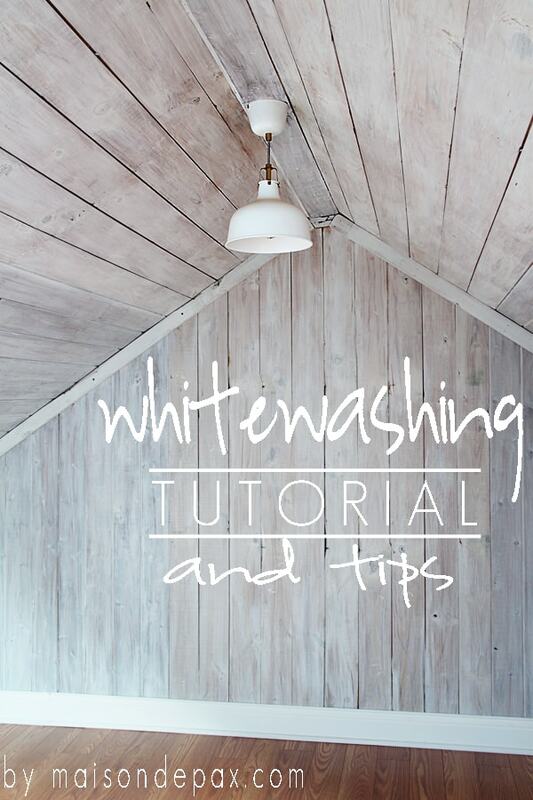 I love it:D I’m sure you know this, but, this would be my advice on painting. Give it some time to soak in…live with it awhile. Sometimes we can be in such a hurry to “fix something” that drives our “eye” crazy- all to find later that you wish you would’ve done it differently! Lol! It really looks beautiful. Absolutely stunning! My opinion is to leave them all wood. 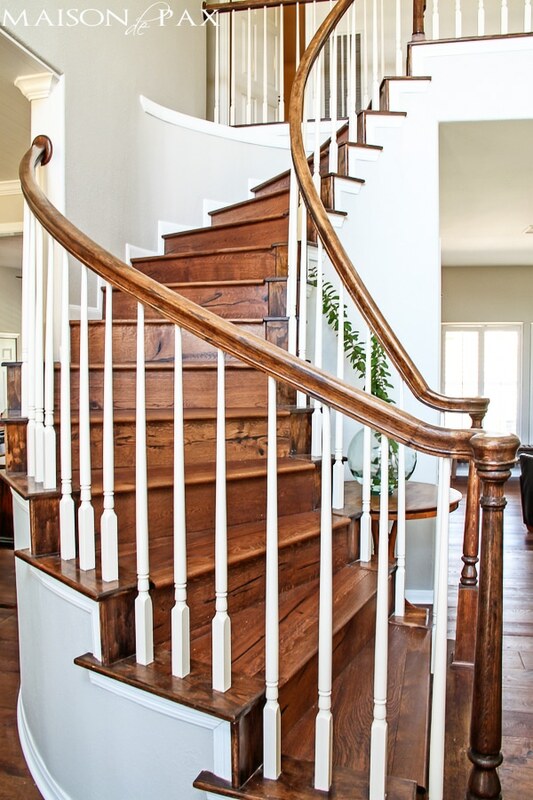 There is plenty of existing white and gray area to balance your gorgeous sweeping staircase, and painting part of them I believe would cut up the incredible impact they have as a prime feature connecting upper and lower levels. Looking forward to your new projects! I would leave the stairs wood. There’s enough white with the spindles. Lovely floors!! Beautiful. If I was going to paint anything on the stairs it would be the bit where the spindle meets the stair, I think it would frame them beautifully. However.. I would wait and live with it a little first before you do anything. Oh my goodness! That staircase is spectacular! Love the wood! Stairs look wonderful and i love all the wood. I think you should paint your hand rail then step back and see or you could always paint more than the handrail later. I would be the first to say that painting the risers white would be gorgeous, but I love them the way they are! I’d wait, as several others have suggested. There will be time down the road to add that detail if you wish. with so much other projects to deal with, this stairwell can wait. it.is. rich. Maybe painting the door would eliminate the “too much wood” . so happy for you with the new home. another blessing! Thank you Lord. 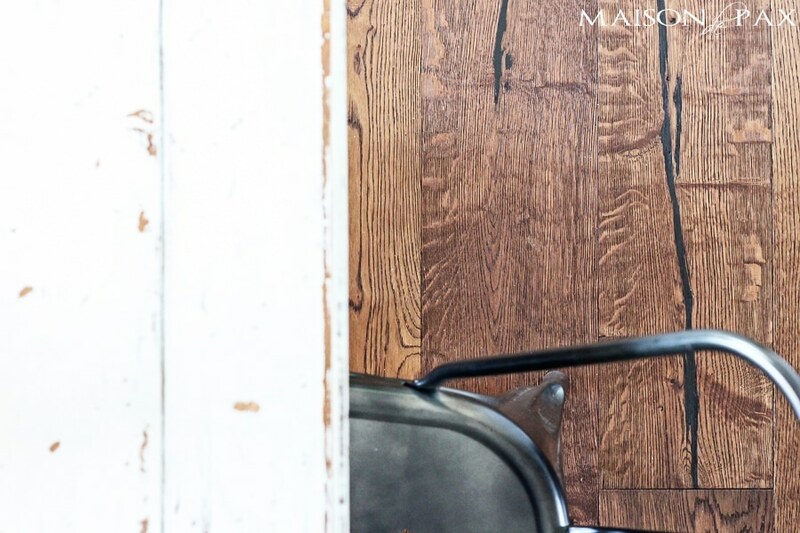 The floors are beautiful, like others have said…give it time. I love the staircase and would not paint it. Looking forward to seeing the rest of the house. The floors and stairs are absolutely beautiful. I wouldn’t paint the risers white. 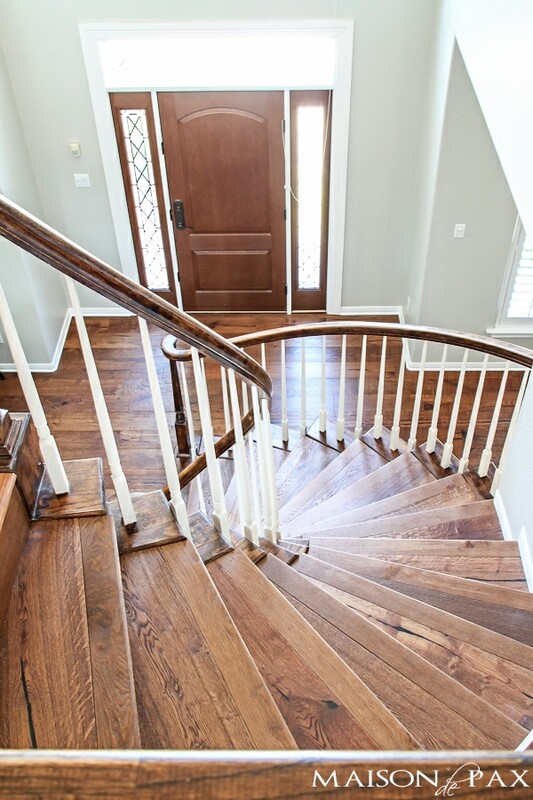 The wood adds even more character and charm to the stair case. Plus if you paint them don’t they eventually get scuffed from shoes. That sounds like more work for me and I always choose the path of less work. Seriously, they look fabulous! I know you see the beautiful graceful lines your wood handrails make against the light walls. Painting the rails would make them disappear. Also, painting the part of the stair against which the spindles rest would eliminate the wonderful contrast made by the dark edges of the risers and treads when viewed from the outer walls of the stairway. The new floors looked gorgeous! I love that you went with such wide planks. At this point, I would just leave the stairs for awhile until you have a chance to live with them. It all looks so beautiful! I painted the back of my stairs white. It broke up all the stain. I would love to know if I could add your photos and a link to your bloog on our GreenWorld Industires website, who installed your floors? Gorgeous floors Rachel and what a staircase!!! LOVE seeing pictures of your new home! Regarding the stairs, I painted the vertical risers on said fixer upper, lake house and it made a huge difference. Huge! It just broke the wood up nicely. Our staircase is visible, like yours, and it made it feel more grown up and chic. 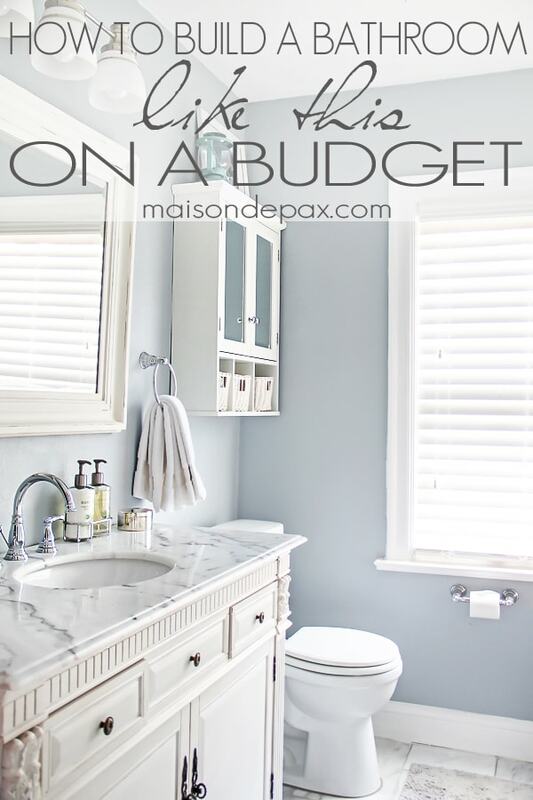 I was destined to stalk, I mean follow you: agreeable gray is the color I used in both of my moms houses (the one to sell and the one to live in). It is just griege enough to accentuate or tone down nearly every color. The floors are beautiful but my eyes kept going to the gorgeous stairs! Love them! (Maybe because an affordable makeover on our stairs is my biggest struggle right now lol.) I love fresh white trim detail but do love them as they are as well. Leave the wood on the stairs, it looks great!! Are you happy with the floors? I have been considering the same one and am wondering how it’s wearing for you. The floors are gorgeous!!! I think you would regret it if you painted any of the wood white. They are perfect as is! Love the all wood look! Do you still enjoy your floors? We are considering these for our downstairs and have so many questions. Maintenance of the oil finish and having them in the kitchen. Thoughts?